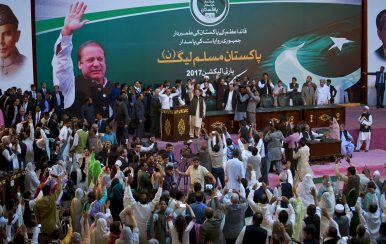 Pakistan's former Prime Minister Nawaz Sharif, center, is greeted by his party supporters during the party's general council meeting in Islamabad, Pakistan (Oct. 3, 2017). Nawaz Sharif’s refusal to let go of party leadership might jeopardize the PML-N’s future. Despite passing an Electoral Reforms Bill to allow the ousted Prime Minister Nawaz Sharif to keep presiding over the ruling Pakistan Muslim League-Nawaz (PML-N), the party might need a rethink after an accountability court indicted Sharif in corruption references filed by the National Accountability Bureau (NAB). The charges over the graft cases, framed with regards to the Sharifs’ London properties, Azizia Steel Mills, Jeddah’s Hill Metal Establishment, and the establishment of 15 companies “beyond the family’s legal resources” mean that the party has only two options in the immediate future. The first is to take the legislative route again to avoid conviction for the PML-N president after having paved the way for his return to the helm of Sharif’s eponymous party. The second is to restructure the party in a way that the inevitably prolonged legal proceedings don’t forestall their campaigning for next year’s elections. This would mean, perhaps, taking the decision that the party mulled following Sharif’s dismissal at the hands of the Supreme Court in July and making his brother, Punjab Chief Minister Shahbaz Sharif, the party president. The reports of the Shahbaz and Nawaz families being at loggerheads came after the National Assembly-120 by-election last month, for which Maryam Nawaz campaigned on her ailing mother’s behalf. She received no visible support from Hamza – usually in charge of most electoral assignments in Punjab, especially Lahore. So, having perhaps foreseen the potential indictment, the Maryam-Hamza meetup might be a signal that the Nawaz camp is willing to pass the baton of leadership on to the Shahbaz family – even if temporarily – as the accountability court cases linger well into the election year. However, the PML-N might have to consider that NAB has also moved the Supreme Court against a Lahore High Court decision to acquit the Sharifs in the Hudaibiya Paper Mills case – which also names Shahbaz Sharif. But with the leader of the main rival party, the Pakistan Tehrik-e-Insaf’s Imran Khan, fighting multiple court cases himself and the reopening of the Hudaibiya Paper Mills case likely to take some time, opting for Shahbaz as the party leader could bring temporary respite to the ruling party, if nothing else. That Shahbaz should replace Nawaz is no longer an outsider’s observation, and is conspicuously creating ruptures inside the party as well. On Thursday, Riaz Hussain Pirzada, the federal minister for inter-provincial coordination, unleashed a tirade against Nawaz, with party insiders confirming that it might just be the start unless the former prime minister makes way for the sake of the party. And yet, despite corruption charges spiraling from the Panama Papers leak that have now seen Sharif indicted by an accountability court and could ultimately see him jailed as well, the Nawaz family might opt for prolonged agitation against the verdicts instead of taking the prudent way out. Nawaz Sharif believes that it was his self-portrayal as a victim at the hands of a joint military-judiciary “conspiracy against democracy” that helped the party win the NA-120 election, albeit with a narrower margin. Hence, he’s likely to further embrace that narrative if and when he is sentenced to prison. What Sharif is clearly missing out on is the reality that the NA-120 win was a case of inertial voting by the party loyalists, whose number has clearly decreased after his ouster as prime minister. He also doesn’t seem to be factoring in that since 2013, multiple by-elections in Punjab have finished with a PMLN-PTI one-two finish, with the ruling party edging out their growing nemesis in close contests. Should a significant number of those closely contested seats swing the PTI’s way next year, the PML-N’s majority would be under threat. And so, by clinging on to party leadership Nawaz Sharif is perhaps banking on Imran Khan’s electoral ineligibility as a result of one of the many charges that the PTI chairman is fighting. A Nawaz-less PML-N would overpower an Imran-less PTI at a canter. Who Benefits From Pakistan's Sit-Ins? The winners: hardline Islamists. The loser: Pakistan's democracy.